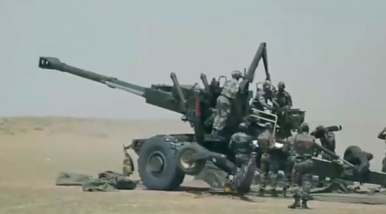 The Indian Army has taken delivery of the first six of 114 indigenously designed and developed Dhanush 155-millimeter/45-caliber towed howitzers this month, the service said in a statement. The Ordnance Factories Board (OFB), the Indian Ministry of Defense’s (MoD) own defense equipment manufacturer, handed over the howitzers in an official ceremony at the Gun Carriage Factory in Jabalpur district of Madhya Pradesh in central India on April 8. It is the first long-range howitzer to be manufactured in India. The Dhanush howitzer is an upgraded variant of the FH-77B 155-millimeter/39 caliber towed howitzer manufactured by the Swedish defense contractor Bofors — now BAE Systems — 414 of which were acquired by the Indian Army between 1987 and 1991. In comparison to the FH-77B, the Dhanush’s barrel is 877 millimeters longer. The howitzer is based on schematics supplied by Bofors/BAE Systems under a technology transfer agreement concluded in the late 1980s. The Dhanush howitzer is a reverse-engineered upgraded variant of the original Bofors design weighing less than 13 tons. ‘Dhanush’ has been mechanically upgraded to fire standard NATO 155 mm ammunition and can accommodate both boll bags and the bi-modular charge system (BMCS) which have resulted in increasing the range. ‘Dhanush’ has also been electronically upgraded to enhance the firing accuracies, laying speeds of the existing gun and to provide compatibility with various kinds of ammo as well. The manufacture of a 155 mm modern artillery gun was initially a challenge for OFB. This was due to change in the vision parameters from 155×39 caliber to 155×45 caliber. OFB received the Transfer of Technology (ToT) documents pertaining to 155×39 caliber and then converted it to 155×45 caliber successfully. The first lot of 36 Dhanush howitzers is expected to be manufactured by December 2019. Forty-eight more will be built in 2020, with the remaining 48 howitzers to be delivered to the Indian Army by the end of 2022. The per-unit price is a little over $2 million. No contract has been signed for the remaining 300 towed howitzers. India’s Defense Research and Development Organization has also been working on an upgraded variant of the Dhanush howitzer, designated Dhanush Version 2 (v2) with a larger caliber — 45 to 52 millimeter — and a slightly increased range — 38 to 42 kilometers. According to the Indian MoD, 81 percent of the Dhanush’s components are indigenously made, a number that is expected to rise to 90 in subsequent production tranches. India’s defense ministry and the Indian Army reportedly cleared the production of 114 Dhanush 155-millimeter/45-caliber towed howitzers.